One of the first Alberta outfitters to stand out in history is Tom Wilson who, in 1881, joined the survey of what is now the Stoney Indian Reserve near Banff, Alberta. He quickly learned how to pack a horse and followed old native trails up the Bow Valley. He is the first person known to have outfitted for hunting clients in Alberta. 1922: In May of 1922 several guides and outfitters formed the Rocky Mountain Outfitters Association. Their objective was to have one official body to negotiate opportunities and rights with the Dominion and with provincial governments. During the 1920s and 1930s, outfitted hunting evolved into big business. More and more journalists, including the famous American outdoor writer, Jack O’Connor, took advantage of outfits like Roy Hargreaves, who was based out of Mount Robson Ranch and hunted along the Alberta/British Columbia border. 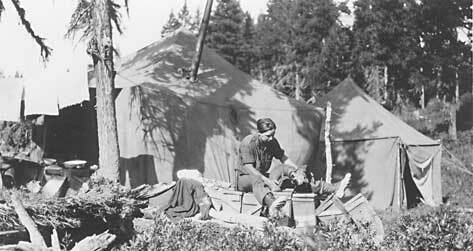 Hargreaves had previously made a name for himself when he personally guided Bill Chadwick on a 1935 bighorn sheep hunt from Mount Robson Ranch to Sheep Creek Valley in what is now Willmore Wilderness Park. Chadwick was pleased with this hunt and invited Roy Hargreaves to accompany him on a Stone sheep hunt in British Columbia. This expedition became one of the most memorable in history when in 1936 they took the world-record “Chadwick Ram” in the Muskwa Valley, arguably one of the world’s greatest big game trophies. Hargreaves guided O’Connor on a lengthy hunting trip in 1943. Jack and other journalists wrote articles in numerous outdoor magazines about the wonderful opportunities in Alberta, making hunting our province an increasingly popular hunting destination. 1932: The Alberta Outfitters Association (AOA) was formed to represent the interests of trail riders and set standards for the industry. Members were required to have a certain number of horses and specific equipment. The organization sought to collectively market their product and lobby the government on common issues. 1970: At this time, the Alberta government decided there was a need to limit bighorn sheep allocations for non-residents in order to best manage the resource. Most of the active outfitters of that day were allotted six non-resident permits each, but these were later reduced to four. Some of these outfitters included Tom Vinson Sr., Roy Trimble, Jim Colosimo, Dave Simpson, Jim Simpson, Charlie Stricker, Bazil Leonard, Chester Sands, Myrtle Ravio, Ed McKenzie, Sammy Sands, Randy Babala and George Kelley. Up until this point in time, no outfitting restrictions had been placed on any big game species. By the late 1980s, several outfitting organizations were in existence to represent the interests of outfitters who were not in the AOA. The Professional Outfitters Association of Alberta (POAA) was created under the direction of Leroy Fjordbotten, Minister of the Department of Forestry, Lands and Wildlife to encourage unity and consensus within the industry. 1989: An Outfitter-Guide Policy was developed by government which limited outfitted hunting harvest opportunity. A previously unlimited harvest was replaced with a fixed number of licences available to outfitters for each species in each Wildlife Management Unit. The distribution of these licenses was determined through an auction. 1997: On March 31, five outfitters signed an application to create the Alberta Professional Outfitters Society (APOS). The POAA was absorbed by APOS; the new body was charged with the responsibility of managing the outfitting industry on behalf of the Government of Alberta. 5) Information pertinent to the industry would be shared with the membership through regular communication initiatives and processes. With the purchase of an outfitter's licence, all outfitters would now become members of APOS and APOS would collect the annual fees paid for allocations. A percentage of this sum would be retained to fund the daily operations of managing the industry and the Society, while the remainder would be remitted to the provincial government. 2001: A Legacy Fund was created to support initiatives that benefited outfitting, hunting, habitat and wildlife. The primary source of fund revenue was derived from the proceeds of the APOS annual convention. Between 2001 and 2010, APOS distributed nearly a million dollars through the Legacy Fund to many worthwhile projects. 2003: A Wildlife Management Fund (WMF) was established during the 10-year renewal of allocations process, funded through reconfirmation fees. The reconfirmation fee is an additional fee per allocation that is to be collected every ten years and goes for a 100% to the WMF. This money is earmarked annually for aerial big game surveys and inventories, and providing funding for studies of specific wildlife species or issues. Approximately $150,000 is generated annually in support of these conservation initiatives, guided by a committee comprised of representatives of APOS and the Government of Alberta. 2004: APOS absorbed the members of the Waterfowl Outfitters of Alberta (WOA). A waterfowl outfitting management system was developed and implemented to ensure waterfowl outfitters would be distributed evenly across the landscape. This also provided them with a measure of operational security. Alberta’s waterfowl hunting outfitters now host as many clients annually as Alberta's big game outfitters. 2013: The APOS Board of Directors adopted the Carver Model of Policy Governance for managing the affairs of the society, reinforcing the notion that the Board acted on behalf of the membership and clarifying through policy the roles and responsibilities of the Board and the staff. 2014: APOS and the Government of Alberta signed a Memorandum of Agreement regarding the allocation of licences to hunt big game. Often referred to as the “Tenure Agreement”, this agreement provides a measure of security for APOS members with respect to their allocations. This renewed agreement, originally signed in 2003, runs until March 31, 2023, with a mid-term review slated to be completed in 2018. 2015: APOS and the Government of Alberta signed two key agreements. The first was the Memorandum of Understanding that establishes the roles, responsibilities and key programs for APOS as a DAO. Each of the identified programs are further defined in specific Program Agreements. The Solicitor General’s office and APOS renewed their Information-Sharing Agreement that serves as the foundation for exchanging data related to the suitability of individuals to receive an Outfitter-Guide permit or a Designated Guide’s License. It is through this agreement that APOS receives notification of wildlife-related convictions incurred by members. The agreement has no defined expiration date. Alberta has emerged as an international leader in the outfitting industry. An independent 2014 study showed that the total value of economic activity generated by outfitted hunting in Alberta exceeds $100 million annually. The Society currently boasts approximately 484 outfitters and some 1,400 guides. Outfitters hold about 10,000 big game allocations, with current utilization hovering around 50%. The outfitting industry is subject to broad economic influences on an international scale, from natural catastrophes like Hurricane Katrina, to economic downturns, to the strength of the Canadian dollar. The outfitting industry in Alberta is also impacted by the state of the province’s wildlife populations which, in turn, are influenced by weather, habitat conditions, predator populations and management strategy. APOS is an active partner in Alberta’s multi-stakeholder approach to wildlife management and is represented on key committees and boards including the Alberta Game Management Advisory Group (AGAP), Alberta Game Policy Advisory Council (AGPAC), the Alberta Conservation Association (ACA) and the Alberta Outdoor Coalition (AOC). APOS also interacts independently on a regular basis with the province’s Fish and Wildlife Division. It’s been more than one hundred years since Tom Wilson provided the first guided hunting excursion on Alberta soil. So much has changed, and yet so much remains the same. Tom would appreciate the aromas of wood smoke, freshly-baked bread and pure mountain air. He’d still be mesmerised by the whistle of an elk, the smell of gunpowder on a frosty morning, and the warmth of the sun in a quiet meadow. Tom would recognize a well-mannered horse, a hunter with scruples, and a guide with a sense of humour. He would be charmed by the satellite phone and awed by GPS. One can only guess at his response to gun laws, passports, and export permits! A credit card would foul his banking program, and the GST would irritate his western spirit. Tom would, however, be humbled by the sophistication of today's industry. The passion of the early pioneers continues to motivate today's outfitters. When matched with spectacular scenery and an abundance and diversity of wildlife, it’s no wonder that Alberta continues to remain a top world destination for guided hunting experiences. Although 100 years is relatively short compared to the history of North America, the commitment of those who outfitted in Alberta through that time forms the foundation for today's outfitting industry.